As the sand settles on one of the largest – and more difficult – spring break weeks here in recent memory, Miami Beach officials are grappling with ways to better control the masses and rein in the most egregious behavior. Rowdy crowds, public drunkenness, scooters speeding and running through intersections, and traffic gridlock during the week culminated in a chaotic weekend in which outdoor café tables on Ocean Drive were overturned during stampedes of spring breakers, spilling their contents onto the sidewalk. Cafés from 7th to 11th Streets were forced to close out of concern for the safety of their employees and guests and, for an hour Saturday night, the MacArthur Causeway, one of the main entrances to Miami Beach was shut down after officials said the City had reached maximum capacity. In conversations residents have been asking each other, “Is this spring break rougher than usual?” Fort Lauderdale, which famously ended its spring break tradition in the late 80s, comes up often. James Schiltz published his Master’s thesis in 2013 on Fort Lauderdale’s effort to rid itself of its tawdry spring break image. The thesis, “Time to grow up: The rise and fall of spring break in Fort Lauderdale”, is making the rounds on Miami Beach-centric social media. Troubled by spring break’s adverse impact on their city and quality of life, Fort Lauderdale and its citizens were at a crossroads by the mid-1980s. The city could continue embracing spring break and hope to find a way to overcome its difficulties or it could shun collegians and deal with the negative financial consequences. Whereas students’ commercial contributions had traditionally overwhelmed calls for terminating the event, a growing list of concerns arising from the spring breaks of the early 1980s – especially 1985 – fostered widespread sentiment among residents and officials alike that the cost of hosting the yearly party may have finally outweighed its benefits. During the early 1980s, many residents finally realized that notoriously thrifty collegians were not the ideal type of tourists… To account for limited budgets students crammed into hotel rooms, slept in their cars, and subsisted on meals from fast-food restaurants. In March 1983, for instance, Fort Lauderdale’s Burger King had the highest monthly volume in the United States. Last week, 400 colleges were on break, the peak of the 2018 season. In a letter to Commissioners on Sunday, the day after the most difficult evening of spring break, City Manager Jimmy Morales said the City experienced “some of the largest crowds we have ever seen." That night, large numbers of people swarmed Ocean Drive when they were forced off the beach for the evening trash and debris clean-up. At a couple of points there were what were described as “stampedes” down the street, creating chaos and fear at the outdoor cafés. When a broken bottle was mistaken for a gunshot, a crowd of people can be seen running from one restaurant in a video posted on social media. One police officer suffered a fractured wrist when he put his arm up to block a bottle thrown at his head. Later, an occupant of a car fired a shot into the air near 5th and Washington. It is Saturday Night at 8:56pm and we have just had the 2nd Human Stampede of the night that totally disrupted our cafe tables and customers. People also running away without paying checks. 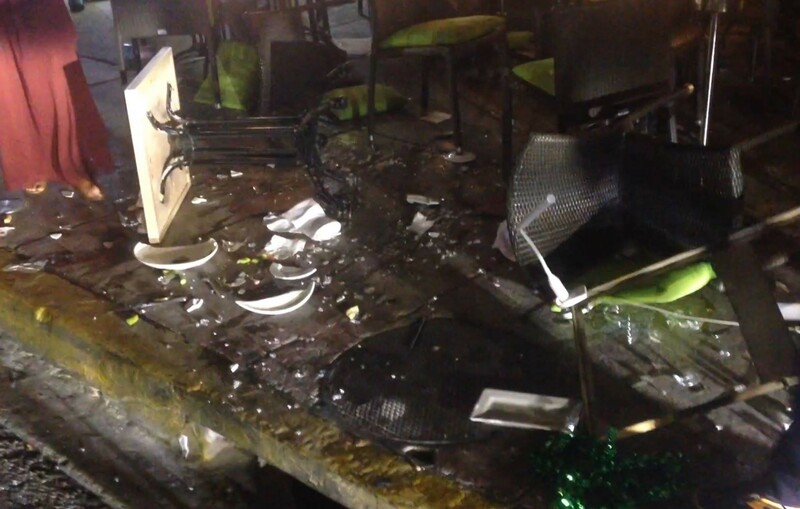 It is too dangerous and disruptive for sidewalk café staff and customers to keep the café tables open. We are closing the entire sidewalk café and taking the chairs away. If the danger subsides later in the evening Maybe we can reopen it. I am shutting down entire Clevelander operations at 10pm. Staff are scared and there are not enough city resources to handle the crowds in the streets. This is not an issue about what is IN our business. It is an issue about what is Outside our business and their lack of respect for our laws and community. One of the common themes expressed by the residents and business owners RE:MiamiBeach spoke with this week was lack of enforcement. Wallack specifically mentioned the open container laws. “Police policy must evolve to not being ‘nice’ and non-confrontational, to being ‘effective’, and concentrating on all disruptive activity, illegal activity and disrespectful behavior." What is the systemic problem? Cheap hotel rates ($50 a day for up to 4 people), wholesale liquor stores and cheap liquor, little causeway controls and lax or ineffective enforcement of city ordinances and aggressive behavior on transients, and an atmosphere of.... “Bums Gone Wild”. We must start marching in the direction of the cannon fire rather than playing a “scorched earth” policy with our local businesses. The responsible businesses have already suffered immense collateral damage, and our hardworking employees continue to suffer every day this problem goes on, as does our national and international reputation. Wallack closed by indicating his willingness to sit down with City leaders to come up with solutions to the problem. The past few days of Spring Break rank with a handful of other party weekends as one of the worst we have seen in our 15 years here. Trisha and I have great faith in all of you and in our police. We are confident that as our city leaders, if you make it a priority, you will find solutions going forward to maintain the city’s deserved reputation as the capital of sun and fun while simultaneously making it abundantly clear that Miami Beach will not tolerate the kind of abusive and reckless behavior that is at times an illegal assault on all our sensibilities. You all have plenty of work to do and no reply is necessary. Trisha and I will find your answer in the steps you take in the future to make certain that days like the last few are not a harbinger of the beach’s future. On Sunday, City Manager Jimmy Morales announced some extra steps the City was taking as a result of the weekend’s events. Crowds would not be moved off the beach en masse for cleaning crews, police officers would be stationed at critical intersections on Collins Avenue within the Entertainment District to keep cars moving, and additional officers would be out on Sunday night in the District. Morales also noted that parked cars would be removed from Ocean Drive. “The presence of parked cars at night created issues with people partying at their cars and then traffic issues when the cars wanted to leave during the road closure,” Morales said. In discussions with Police and members of the Ocean Drive Association, there are other measures that we may consider in the future (particularly addressing the issue of scooters and other motorized 2-wheel vehicles). We welcome college students that come here to have safe fun and enjoy our many natural resources and hot spots. But we want them to do that in a climate that protects our residents, businesses and visitors alike. One of the challenges commonly expressed was the sheer size of this weekend’s crowd. 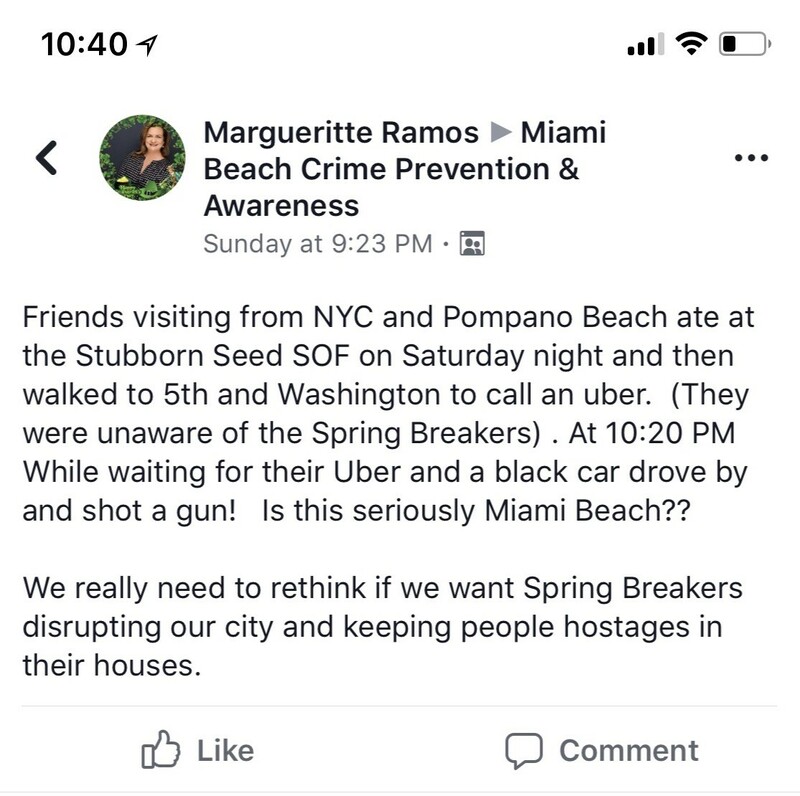 John Deutzman, one of the founders of the Miami Beach Crime Prevention and Awareness Facebook group said, “I’m not anti-spring break … but what happened over the weekend, particularly Saturday, is we were over capacity. It was too many people. It was too dangerous for that amount of crazy, drunken people.” That amount of people, in turn, made enforcement impossible, Deutzman said. The crowd wasn’t only on Ocean Drive. When vehicle traffic came to a standstill, one of Oates’ police captains recommended closing the MacArthur Causeway. Oates knew it was an option though he admitted to being “anxious” about the decision but “traffic wasn’t moving in South Beach and that’s dangerous for emergency response and those kinds of things. We had to clear out the traffic.” Closing the Causeway for one hour between 8:45 and 9:45 netted the desired results. “Obviously it was a tremendous inconvenience to everyone but it was definitely the right move in sort of resettling the city,” he said. When asked if he had enough officers on the street, Oates said “at the height of the activity” from 8 to 10 pm, there were 75 officers working in the Entertainment District. At 10:30, an additional 23 came on duty. Looking ahead, he said the department has a program called Alpha Bravo in which all officers work twelve hour shifts, a strategy that could be deployed if another high impact weekend is projected. That type of deployment would result in extra overtime expenses to the City but could “easily double” the number of officers that were on the street this past weekend, he said. Oates and Deutzman agree on the difficulty of enforcing the alcohol ban on the beach. “If you have 5,000 on the beach as we did on Saturday and someone is in the middle of a crowd of 5,000 drinking from a bottle, it’s unreasonable to think the cops are going to wade in there and arrest someone for drinking without causing and provoking very difficult situations,” Oates said. “Crowd control is all about balance,” he added. With regard to handling future spring breaks, he noted the City Commission will be discussing the issue at its meeting tonight. “I think there’s going to be healthy discussion,” he said. One of the people involved in the discussion is Mike Palma, the managing partner at The Clevelander, who wrote Commissioners Saturday night about the lack of resources on the street. How do we break the cycle? “Right now, it’s going to be very difficult to start that because of the crowds we’re getting, but we have to start somewhere, little by little,” Needelman said. Joseph Magazine has lived in the South of Fifth Neighborhood for more than four years. He looks at the issues through his decade-long experience in the investment banking industry reviewing state and local government balance sheets. “Miami Beach is unique,” he said. “I’m certainly not denying in any way that tourism is the lifeblood of our economy” but compared to other cities who have reined in their spring break activities including Fort Lauderdale and more recently Panama City Beach, Florida and Myrtle Beach, NC, “Miami Beach has more of a diversification from their revenues,” he said. “We moved to Miami Beach knowing this isn’t Boca, but tourism needs to be promoted in a responsible fashion,” he said. Another resident, concerned about the impression left on visitors is Margueritte Ramos. Ramos lives in North Beach but posted in the Miami Beach Crime Prevention and Awareness Facebook group about an experience friends from New York City and Pompano Beach had this weekend in South Beach’s Entertainment District. After eating at a restaurant South of Fifth, “they walked to 5th and Washington to call an uber. (They were unaware of the Spring Breakers.) At 10:20 PM While waiting for their Uber and [sic] a black car drove by and shot a gun! Is this seriously Miami Beach?? We really need to rethink if we want Spring Breakers disrupting our city and keeping people hostages in their houses.” Ramos was referring to an incident in which the occupant of a car fired a gun into the air. Mouzon’s suggestions include charging a toll for non-resident cars coming onto the beach after 6 pm during special peak times. “They can come for free via Transit of course,” she said. “This is to limit the cars and all that is associated with it.” She would also close Ocean Drive to vehicles on weekends and during peak times and she, too wants more police enforcement. “Make them behave when they are here! Residents should not have to fear for their safety,” she wrote. Commissioner John Aleman has been vocal on social media about what happened this weekend and she echoed Ramos’ sentiment that “people feel trapped.” Like Magazine, she questions the value of the spring break business. She also took aim at the pop up events at the various vacant nightclubs in the City. “The promoters that are bringing all these kids here leveraging our free assets of a beautiful beach and a beautiful city, and the immense security provided by Miami Beach PD and fire rescue, not to mention sanitation, and they’re taking all those city dollars and lining their pockets with it to absolutely no benefit to the city,” she wrote. Faced with a clear popular mandate to diminish the chaotic nature of the tradition, officials enacted a number of measures to crack down on unruliness during spring break 1985, ultimately alienating collegians and fostering the rapid and unthinkable downfall of spring break in Fort Lauderdale by the end of the decade. He noted Fort Lauderdale also aggressively enforced “formerly neglected capacity limits and fire ordinances during spring break 1986.” After passing an ordinance in late 1985 to ban open containers of alcohol, the City also aggressively enforced the new law. Postscript to his thesis: Fort Lauderdale is once again experiencing large spring break crowds, the Sun-Sentinel noting the 2017 spring break season was “larger and rowdier than in years past” with 131 police calls last March, a 72% increase over the previous year. Taking a page from their 1986 playbook, Fort Lauderdale Police this year warned of a “zero tolerance policy” on open containers, underage drinking, creating drunken disturbances, fighting, and public indecency.